THE SAPPHIRES IS A STRANGE MIX. IT OFFERS A WARMLY IMAGINED AND EASILY ENJOYABLE PERSONAL DRAMA THAT EXPLICITLY CONFRONTS RACIAL INEQUALITY DURING ONE OF THE MOST TUMULTUOUS PERIODS OF THE ANGLOSPHERE’S 20TH CENTURY. ON THE OTHER HAND, IT ADHERES SO WELL TO THE CONVENTIONS OF THE HOLLYWOOD ROMANTIC DRAMA AS TO DROWN ANY NUANCE OF HISTORICAL COMPLEXITY IN A STEADY STREAM OF STEREOTYPE. THOUGH IT SUCCEEDS WONDERFULLY AT PROVIDING THE VIEWER WITH AN ENTERTAINING MEANS OF KILLING AN HOUR AND A HALF, IT RARELY PROVOKES MUCH DEEPER INSIGHT. 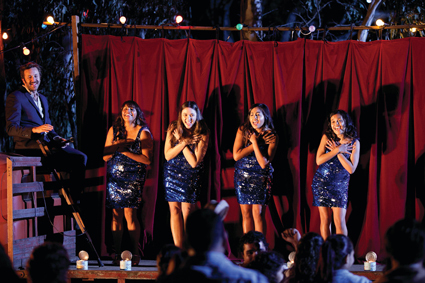 It’s 1958 and on Cummergunga Mission four young girls are putting on a show, singing for their community. Cut to 10 years later, and while folk elsewhere struggle for civil rights, land rights and either fight in or protest against the war in Vietnam, sisters Gail (Deborah Mailman), Cynthia (Miranda Tapsell) and Julie (Jessica Mauboy) are still living on the mission and still singing. Entering a talent contest at the local pub, they encounter Dave Lovelace (Chris O’Dowd) an itinerant Irish musician who, unlike the straightforwardly racist locals, immediately recognises their talent. Scoring the women an audition to travel to Vietnam as entertainers for the troops, Lovelace convinces them to trade Country for Soul and sets about moulding the sisters, along with their cousin Kay (Shari Sebbens), into a girl group à la The Supremes. Not that they’re averse—as Gail drily comments, singing beats “being treated like dogs by the gubbas in town.” Narrative logic takes over as the women travel to Saigon, becoming a hit among the African American soldiery, the thrill at their success tempered by the reality of life inside a warzone. Passions, both romantic and antagonistic, flare amid the battlefields as the reasons for Gail’s hostility towards Kay, whose pale skin has allowed her to pass for white, draws the story back to the apparent innocence of the opening. Adapted from his music theatre work written in collaboration with Keith Thompson, Tony Brigg’s story draws on his own family history—his mother, Laurel Robinson, and aunt, Lois Peeler, sang in Vietnam as young women. The film’s great strengths develop from this, in the relationships between the four women and in the music that unites them. The songs certainly sound fantastic, thanks in no small part to Jessica Mauboy as the sweetly determined Julie, while O’Dowd is similarly likeable as their drolly rumpled manager. However in its relentless focus on the personal, the film cultivates a determined buoyancy that often seems at odds with the institutionalised racism arrayed against the majority of the characters and the vast historical violence unravelling around them. The reasons why a group of Aboriginal women should only be permitted to perform for the entertainment of African American troops remain carefully unremarked upon—indeed, watching the film it would be easy to falsely surmise that blacks accounted for a majority of Americans deployed in Vietnam. Unwilling or unable to accommodate complexity the film falls back on cliche: white people are racist, unless they’re Irish, in which case they’re drunk and charmingly inept, while Aboriginal people are disenfranchised but have sassy mouths, big hearts and are generally deadly. Although The Sapphires is diverting enough, by so completely obscuring the difficult questions of power, class and racial violence raised by the story with the redemptive narratives of individual love and the ‘transcendental’ power of music, the filmmakers do their material a disservice.